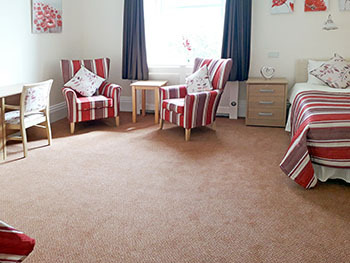 At Thornton Hill care home in Skipton we have recently refurbished one of our double bedrooms. This attractive double bedroom provides spacious accommodation, with new furniture and homely finishing touches. This double room would be an ideal private space for a couple requiring individually-tailored care in their later years. Thornton Hill is a friendly care home offering residential care for up to 52 residents, with home-cooked meals, an array of engaging activities and a beautiful garden space. Set in the heart of Thornton-in-Craven, a handsome Yorkshire Dales village, Thornton Hill care home is close to a range of local services and amenities, including Skipton town centre, market, castle and railway station. For further details on our double room or for more information about the care we offer at Thornton Hill, please call 0800 085 4330.